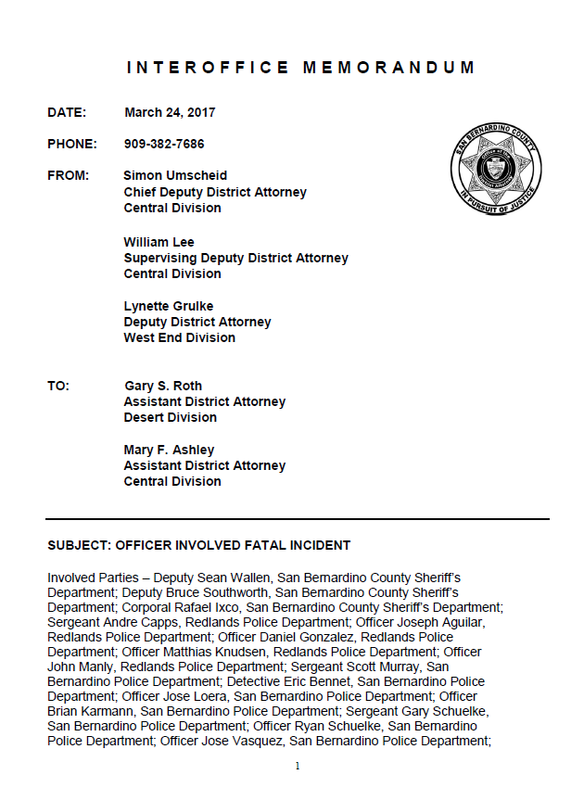 The following summary is based on the San Bernardino Police Computer Aided Dispatch report, the reports prepared by first responders and the Federal indictment of Enriquez Marquez, Jr.
One of the calls, which came in approximately six minutes of the first call, indicated that there was a black vehicle with out of state license plates located to the rear of the building. Multiple calls came in from victims who were injured or were hiding in bathrooms and other area to try and avoid being shot. One caller reported seeing the suspects flee in a black full size SUV. Calls also reported that there were multiple victims down inside the IRC conference room. Officers arrived on scene at the IRC complex within a few moments and began the process of searching for suspects and clearing victims out of the building. Officer Scott Snyder of the Fontana Police Department was on scene at IRC 11:06. He met with Lt. Mike Madden from San Bernardino Police and they devised a plan to enter the building. Officer Snyder was joined in the initial entry into the building with a group of other officers from the San Bernardino Police Department. Officer Snyder was partnered with Detective Lewis. They made entry from the east side of the building. Before entering the building, Officer Snyder noted two victims in the rear area of the building. A male victim was sitting slumped on a bench outside the doors. He also saw a female victim lying on the sidewalk outside the entry doors. Both victims, after an initial check, appeared to be deceased. Officer Snyder made entry into the large conference room on the east side of the IRC Conference Building. He noted that there was shattered glass at the rear entry. The fire alarm system in the building was activated and the ceiling sprinklers were activated spraying water. The room was still filled with smoke and the stench of gunpowder. Once inside the conference room Snyder and the other officers located multiple gunshot victims on the floor who were unresponsive. Officer Snyder along with the other officers went room to room on the first floor evacuating those who were hiding in restrooms and other spaces. The officers went to the other floors in the building and cleared the building. When Officer Snyder returned to the first floor, medical staff was on-scene and attempting to assist those who were injured. Officer Brian Murphy from San Bernardino Police was also one of the officers that made the initial entry into the IRC building within minutes of the shooting. His report describes much the same scene as Officer Snyder. He indicated that he saw as many as twenty victims in the conference room. Some of the victim were on the floor and some were slumped over in chairs. On the date of the shooting, suspect Syed Rizwan Farook (Farook) arrived at the IRC at 8:48 am. At 9:05 Farook entered the IRC conference Room. At 10:37 Farook left the IRC in a black sports utility vehicle. At approximately 10:58 the black SUV returned to IRC. Farook and a second individual exited the black SUV and entered the IRC Conference Center killing 14 and injuring 22 other victims. Based on officers saying that the subjects in the SUV were looking around, Schuelke believed that they were conducting counter surveillance. He put out on the radio that a traffic stop should not be initiated until the vehicle was north of San Bernardino Avenue; an area where there would be significantly less people and traffic. Sgt. Schuelke saw that the Redlands Police unit were coming up from behind with their lights on. The black SUV turned right onto San Bernardino Avenue from Tippecanoe as the marked Redlands unit took position behind the suspect vehicle. Ryan Schuelke notified Sgt. Schuelke that shots were being fire before Sgt. Schuelke heard them. He told investigators that he saw the back window of the SUV shatter but did not realize it was from gunfire from inside the vehicle. Sgt. Schuelke saw Sgt. Capps’ vehicle swerving back and forth and then realized officers were taking fire. The SUV stopped along the south curb of the street past Richardson. Sgt. Capps’s vehicle stopped about ten to fifteen yards behind the SUV. Initially Ryan Schuelke grabbed the AR 15 rifle and began to return fire. Gary Schuelke saw the suspect (later identified as Farook) get out of the SUV and begin shooting at a Deputy Sheriff that was parked north of the SUV. Farook walked north towards the deputy who was taking cover from behind his unit. Sgt. Schuelke took the rifle from Ryan Schuelke. Ryan Schuelke transitioned to his handgun. Sgt. Schuelke had a clear sightline of Farook and estimated the distance at about 80 yards. He fired at Farook with the rifle as fast and accurately as he could, knowing he needed to stop Farook. He utilized the red dot optic on the weapon to fire as accurately as he could at Farook realizing that they were in a residential neighborhood with people likely being in the surrounding homes. Sgt. Schuelke estimated that he took between 5 and 6 shots at Farook’s center mass. One of the rounds passed through Farook causing a mist of blood on impact. Farook fell to the ground but was still moving. Schuelke fired two more rounds at Farook because he was still clutching the rifle. After Farook went to the ground Schuelke saw that rounds were still being fired from within the SUV. Sgt. Schuelke remembered that there were other officers with him at the time also firing their weapons at the suspects. Sgt. Schuelke and the other officers took cover behind a fence about forty yards from the rear of the SUV. The subject in the SUV (later identified as Tashfeen Malik) was continuing to fire from within the SUV. He could see that Malik would fire multiple rounds before ducking down. She would then pop back up and open fire again. Based on Sgt. Schuelke’s position it appeared to him that she was blindly firing towards the officers rather than taking aim. Sgt. Schuelke fired multiple rounds towards the tailgate of the suspect vehicle as Malik continued to fire bursts of rounds towards law enforcement. Sgt. Schuelke could not estimate the number of rounds he fired from that position but reloaded his thirty-round magazine once in between firing rounds at the suspect vehicle. As multiple officers fired at the SUV, eventually Malik stopped shooting back. After the shooting stopped, Sgt. Schuelke heard over dispatch that there was a possible third suspect. He and his officers walked southbound along the fence line but did not locate any possible third suspect.